Ignacio Funes, PhD student in the Maseras group, won the first prize of the “Vols saber què investigo?” (Want to know what I’m investigating?) contest organized by the Universitat Rovira i Virgili (URV). The contest was held at Teatre Bartrina (Reus) and it counted with the participation of six other contestants. 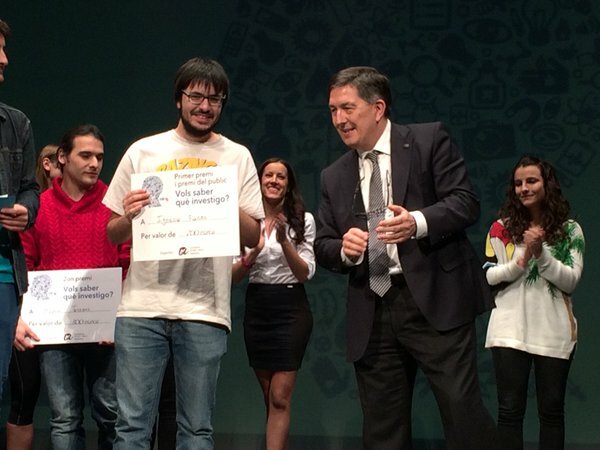 Ignacio did not only win the jury’s 1st Prize (€700) but he also received the audience’s 1st Prize. Ignacio delivered a 5-minute monologue entitled “Rompamos el agua” (Let’s split water”) to enlighten the audience about the importance of catalysts to split the water into oxygen and hydrogen and then use the H2 as a fuel. After his monologue the jury complimented him: “You have no shame” and “If you were a better reggaeton dancer you would get extra points!.” What was clear is that Ignacio honoured his surname. “Vols saber què investigo?” is a contest addressed to PhD students to explain to people which research are they carrying out in a briefly and pleasant way, adapting language to the public and using only personal communication skills, without the support of a power point or any other presentation tool. This contest aims at encouraging researchers to disseminate the results of their work to the general public.